From late 20th to 21st century Honda, Kawasaki, Suzuki and Yamaha continued to dominate the two wheelers market especially in motorcycle industry, although several European and American companies such as BMW, Ducati and Harley Davidson established strong position in niche markets. Significant economic and political developments in emerging economies, including strong growth in Asia has changed the market scenario considerably and forced the manufacturers to adjust accordingly. For low-end models and medium CC bikes manufacturing operations shifted to emerging markets in India, Thailand, Indonesia and Vietnam. The maturing economies in North America, Western Europe and Japan witnessed the increased demand for high-end leisure models, while the developing countries in South East Asia and Latin America augmented a need for easily assembled and inexpensive transportation. Exploding sales in developing countries such as Brazil, India, Thailand and Taiwan is expected to accelerate the market growth in developing regions. Europe and North America two wheelers market is majorly dominated by the high end variants of motorcycle and majorly distributed among the big market players such as Harley Davidson, BMW, Ducati and Honda. In maturing market of Unites States market players such as Harley Davidson has been facing declining sales from past few years and planning to acquire rivalry companies in order to sustain market competition. For instance, there are assumptions that Harley Davidson is looking forward to pursue USD 1.7 billion acquisition of rival motorcycle manufacturer Ducati. The global two wheelers market valued USD 90.1 billion in 2016, including electrically powered two wheelers and also accounted for more than 135 million units sold in same year. Further, the market is anticipated to expand at a CAGR of 6.9% to reach USD 154.3 billion over the forecast period i.e. by 2024. Geographically, Asia Pacific accounted for the highest revenue share in global two wheelers market owing to huge motorcycle sale in India and China. The Asia Pacific will continue to dominate the global demand, representing more than 80% of all units sold across the globe in 2016. 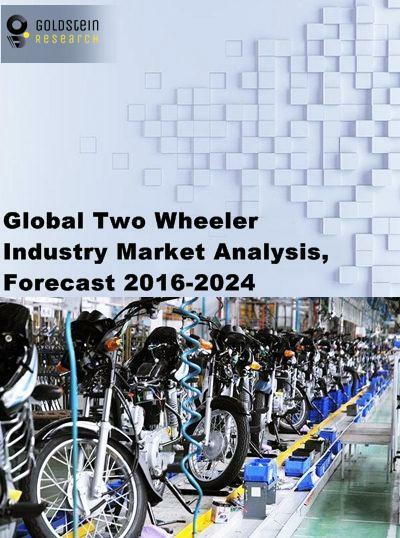 Asia pacific region is followed by the EMEA with considerable growth rate and more than 12% market share collectively in the global two wheelers market. Positive demographic shift in Africa region and rising demand for low and medium cc bikes will led to the significant rise in demand for motorcycles during the forecast period. North America region has witnessed bumpy road in terms of two wheelers sales in last decade and now the sales are favorably rising from 2014 with sales in U.S. increased 4.7% to more than 400,00 in 2016. Two wheelers market is boosting in developing economies owing to rapid urbanization and growing middle class annual incomes which led the higher expenditures over transportation convenience. For instance, South East Asia motorcycle market has become the largest third largest market in Asia after India and China. Indonesia and Philippines both surpassed the GNI per capita level of USD 3000 level as per the World Bank data. Whereas, Malaysia and Thailand GNI per capita income stood at USD 10,400 and 5,370 respectively according to World Bank. Rising per capita income is one of the maj0r factors driving the growth of two wheelers market in the developing regions around the world. In the mature motorcycle markets of United States and Canada rising number of female motorcycle riders transforming the motorcycle culture and market in the region. The total number of motorcycle registration in United States accounted for 8.4 million in 2014, almost doubles as compared to the number in 2000, as per the data of Motorcycle Industry Council. And many of those registrations were belong to the women riders. The women motorcycle owners in 1998 was only 8% which increased up to the 14% in 2014, which is playing an important role in the growth of motorcycle market in Unites States. However, stringent environmental regulations to curb vehicle emission across the globe have adversely affected the growth of global two wheeler market. For instance, China banned the IC engine powered two wheelers in its mega cities which led to the declined sales of conventional two wheelers. On the other hand, in developed regions such as North America and Europe motorcycles are mostly used for recreational purposes which limit the market among certain age group which is majorly a Caucasian male aged over 35 years.